John Holdren now works for Barack Obama as his Science Czar, of course, but just a few years ago, in 2005, he was one of Mitt Romney’s advisers on the issue of carbon dioxide regulation. This is part of the entire range of global warming hoax science, but what is stunning is that John Holdren could have been a Romney adviser at all. Holdren is now Barack Obama’s Science Czar, but throughout his career in academia, he has been a raging leftist ideologue who ceaselessly advocated bizarre and tyrannical ideas, including the notion of involuntary birth/fertility control, and forced sterilization of women in order to control population growth. To find that he had been working for a time as an adviser to Mitt Romney raises further troubling questions about Romney’s judgment, and his claims to be a conservative. For his part, Holdren denies being an advocate of these positions, but he co-authored a book in which these tyrannical ideas for the sake of population control were advanced. In the end, Romney enacted vast and radical new strict emissions regulation schemes in his state of Massachusetts on the advice of this hard-left activist. Holdren is an infamous leftist ideologue, and his work in the realm of environmental advocacy is well-known. He is a part of that community of flaky scientists that includes many who can’t wait to control all human activity, even by compulsory means. In 1978, he co-authored a book with famed population scare-mongers and radical environmental activists Paul and Anne Ehrlich, titled Ecoscience: Population, Resources, Environment. (The links above on fertility control and forced sterilization come from this book.) Paul Ehrlich, you may remember, is the author of the infamously wrong-headed, 1971 Population Bomb. Holdren was a losing party in the famous Ehrlich-Simon Wager, and has been a mover and shaker in the extreme left’s environmental agenda. He also served as a science adviser to Bill Clinton from 1994-2001. My question remains over why Mitt Romney would use this man as an adviser. This is the troubling part about Romney’s latter-day reversals on a range of issues. Until he began running for president, Romney was a very liberal politician, and for him to claim now to be a conservative seems generally dishonest. 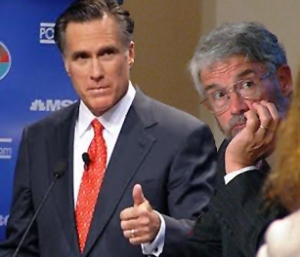 That he appointed Holdren as one of his advisers on environmental policy during his term as governor really calls into question the entire proposition that Romney had been anything but a liberal. How is Romney going to differentiate between himself and Obama in a general election campaign? He certainly can’t criticize Obama’s Science Czar, can he? This is likely the reason Obama’s campaign can’t wait to face a Romney candidacy: They know everything about him, and will be able to make mince-meat of him because one of their own was an insider in Romney’s camp. I have argued that Romney is effectively neutered against Obama. Now you can see why.